Sound "When I inserted the BPT products into my system, the noise floor wasnt lowered -- it was gone," imparting "more immediacy and detail" in the process; "I think I can finally use the term 'grain-free' and know exactly what it means." Features Balanced power designs that "remove noise by a process called common-mode rejection"; BP-2 Ultra Edition has eight outlets, the BP-Jr. two; captive power cords for both. Use "If your electricity is clipped or the noise on your line is differential (the opposite of common), then the common-mode rejection that balanced transformers are great at addressing wont help"; should remain plugged in (and thus powered) at all times. Value "If youve been sitting on the fence waiting for a great power-line product at a great price to come along, this is the time to get on your feet. With BPTs 30-day money-back guarantee, what do you have to lose?" I have a confession to make. When I was given the assignment to review two power-line products, I was less than enthusiastic. Yes, power-line conditioners seem to be a hot hi-fi topic, but do these things really make that much of a difference? The thought of reviewing one seemed to me the equivalent of reviewing an equipment rack, but two? Death. 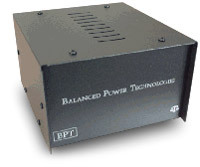 The products of Balanced Power Technologies probably aren't as familiar as those from PS Audio, MIT and Tice. The company hasnt been around very long and is pretty much the brainchild of one guy, Chris Hoff. Two benefits of BPT products are that they are sold directly to consumers (dealer inquiries are welcome though) and come with a 30-day money-back guarantee. All BPT products, including discounted demo units, carry a one-year parts-and-labor warranty. Shipping to and from the factory is not covered, however. Looking back at the archives here at SoundStage!, I see that five power-related products were reviewed in 2001 alone. So what does Balanced Power Technologies bring to the table thats different from the competition? BPT employs a technology commonly referred to as balanced power. A more appropriate name for BPT products is power transformers or isolators instead of line conditioners because they dont somehow massage the electricity like line conditioners do. Instead, balanced transformers remove noise by a process called common-mode rejection. This will, if the electricity in your house has a normal sine wave, lower the noise floor of your system considerably. However, if your electricity is clipped or the noise on your line is differential (the opposite of common), then the common-mode rejection that balanced transformers are great at addressing wont help. The basics around power-line conditioners are pretty much common knowledge at this point, so I wont bore you with the details. Whats important to remember about BPTs products is that they all have exact power ratings that should not be exceeded by the draw of equipment connected to them. The two units I received for review were the flagship BP-2 Ultra Edition ($799) and the smallest model in the line, the BP-Jr. ($249). Because the BP-2 I received had the Ultra Edition upgrade, which costs $200, its case was a polished stainless steel -- it's plain, black metal for the standard BP-2. Also included in the BP-2 Ultra Edition is an improved, heavier-duty, braided attached power cord. All outlets are upgraded to hospital grade too, and there is separate filtering for each duplex outlet to reduce component interactions. The BP-2, Ultra Edition or not, has four duplex outlets -- a total of eight receptacles. The BP-Jr. was housed in a black metal case and had a normal plastic-encased power cord attached to it. The BP-Jr. boasts one duplex outlet. An Ultra Edition BP-Jr. is not currently offered, but an upgraded Signature Edition is available for $349. It reportedly gives all the benefits of the Ultra, but there is no stainless-steel case. The power rating for the BP-2 Ultra Edition is 2000VA, which provides over 17 amps of balanced 120VAC to your delicate equipment. The BP-Jr.s maximum power rating is 300VA, which delivers 2.5 amps of balanced 120VAC. Both could be used for amplifiers or electronic sources, with the only limiting factor again being the rated maximum amount of current draw. In turn, the BP-Jr.s low power rating makes it impractical to handle amplifiers of any realistic load. For my review, I mixed and matched components, but for the most part I used the BP-Jr. for my CD and DVD players and the BP-2 Ultra Edition for everything else. I recently moved into a carriage house that was built in 1914 and converted into a two-storey house in the 1940s. When I moved in, there wasnt a grounded outlet in the place. Knowing that I had the BPT products on the way, I ran to a nearby Lowes and bought a hospital-grade outlet and some grounding wire. I made an isolated ground for the new lone duplex outlet that would power my entire audio system. I ran the ground cable to a hot-water pipe that goes through my entire house. Before you could say ground fault -- voilà: any surge protectors or power conditioners I wanted to use could finally work properly. The BPT units arrived a day apart from one another. When I tried to lift the BP-2 Ultra out of its box, it seemed like it was filled with lead. Even the diminutive BP-Jr. had some heft to it. In terms of appearance, all I can say is both units are something only the Borg from Star Trek could love. Neither has an on/off switch, light, dial, or anything that would indicate that the unit does something. The only hint that these are in fact electronics and not metal boxes filled with lead shot are the power cords attached to both units and the outlets on the rear panels. All the circuits in my house are rated conservatively at 15 amps, but the instruction sheet for the BP-2 Ultra Edition recommends connecting the device to a dedicated 20-amp outlet. I soon found out why. The moment I plugged in the BP-2 Ultra, it tripped the circuit breaker. The manual states, When first plugged in, it is not uncommon to trip a circuit breaker when first installed." This can happen to a 20-amp outlet, so I wasnt surprised. After following BPTs suggestion of removing everything from the circuit and trying again, I finally got the unit plugged in and the circuit to stay live. BPTs instructions describe that initially their products take on a tremendous amount of current (inrush), but then settle down. In turn, the larger BPT models shouldnt be turned on and off like a light switch. Instead, they should be left on all the time, or you will be making daily trips to your electrical box. Ive always experienced a slight hiss from my Arcam gear, even with no music playing and the volume set at zero. Ive used various power-line conditioners and battery backups over the past five years, and the low-level hiss that seemed always present was so minimal that I could tune it out 80% of the time. When I inserted the BPT products into my system, the noise floor wasnt lowered -- it was gone. Sticking my ear right next to my speakers with the volume as high as it would go and no music playing, I heard nothing. It was music to my ears. It made me wonder what have I been missing -- some music must have been buried in that constant low-level noise. After getting over my initial shock of that hiss being gone, I got to work rediscovering my music collection. The first CD I played was The Roy Haynes Trio featuring Danilo Perez & John Patitucci [Verve 314 543 534-2]. The first track is a great rendition of Bud Powells Wail. With the BP-2 and BP-Jr. in use, everything seemed to have a little more immediacy and detail. The drum set was right on and sounded more lively and fresh. No, the BP-2 Ultra and BP-Jr. didnt solve world hunger or bring me infinitely closer to the performers. My soundstage didnt seem wider, nor did anything really leap out of the speakers at me. What the BPT products did do was definitely clean things up a bit. Treble was improved, and everything had more immediacy to it. I think I can finally use the term grain-free and know exactly what it means. Loudspeakers  B&W DM602, Linn Kan.
Preamplifier  Arcam Alpha 7r integrated amp. Power amplifier  Arcam Alpha 8P. Digital  Arcam Alpha 7 CD player, Pioneer 606-D DVD player. Analog  JVC JL-A40 turntable with Grado Prestige Green cartridge. Tuner  Arcam Alpha 8. Interconnects  AudioQuest Ruby, QED Silver Spiral, Straight Wire Chorus, Tributaries Delta and A3, Transparent Audio The Link 200. Speaker cables  Chord Rumour 2 with BFA connectors on amp end, Transparent Audio The Wave 200. Accessories  AudioQuest Little Feet, Blu-Tack, Lovan Affiniti sand-filled speaker stands, Salamander Archetype equipment rack. A great disc I just received is Mark Levinson Live Recordings at Red Rose Music [RRM 01]. It's a hybrid SACD/CD, and so far Ive only heard the CD layer on my system. (I figure getting enough SACDs lying around will give me an excuse to go out and buy a player.) This album is superbly recorded, and the last track, Alligator Crawl performed by Peter Muir, is a great musical romp. With the two BPT boxes doing their thing, every note from the piano was more full and lively. I couldn't help but play the air piano when I heard it. After getting more accustomed to the effects of the BPT units, I started reconfiguring my system to see if I could tell a difference between using just one of the units, and where each seemed to have the greatest effect. To my ears, having everything plugged into the BP-2 Ultra Edition seemed to have the exact same positive effects as having a few digital sources on the BP-Jr. and the amplifiers on the BP-2 Ultra. Having my amplifiers connected to the BP-2 Ultra made the most notable improvement in sound. Adding my analog sources (tuner and turntable) had the next-greatest impact. The smallest improvements seemed to appear when I only had my CD player/DVD player plugged in to either of the units. This speaks good things for the audiophile on a budget. If the BP-2 Ultra's eight outlets can accommodate your entire system, you don't need to buy another unit. But these BPT products do have some faults. I would have liked detachable power cords with both units. Some people may want longer cords or just want to use their own power cords. Another problem I discovered was that certain devices can make loud audible hum appear from the BP-2 Ultra Edition. One evening I had to plug in a small quartz space heater using the same circuit that my stereo is on, and when the heater was set to low, a loud buzzing started emanating from the BP-2 Ultra. If the heater was set to high, no noise came from the unit. Obviously, there is a resistor in the current flow for the heater to operate at a lower setting, but this might apply to other appliances as well. Also, during demanding periods, the BP-2 Ultra could run a little on the hot side. It always ran warm, even at idle. My final quibble is the lack of a load indicator, which would make it possible to know if you're taxing the unit. Not knowing if you're running the unit at 8% or 80% of its maximum load can be frustrating if you want to determine if you can plug more devices in. My time with both Balanced Power Technologies products was very positive. I only wish I had on hand some other balanced-power products with which to compare results. BPT is offering a lot for your money. To buy the equivalent functionality from another maker could cost a few thousand dollars instead of a few hundred. Granted you probably wont get nearly the aesthetic quality or perhaps the fancy regenerating properties from BPT, but what you do get is a killer balanced-power isolator. If you dont mind the Spartan looks of BPTs products and dont need any bells and whistles (trust me, you dont get any with these), then BPT might be a product line worth looking at. If youve been sitting on the fence waiting for a great power-line product at a great price to come along, this is the time to get on your feet. With BPTs 30-day money-back, what do you have to lose? For the price of modest speaker cables, you can buy a product that makes a real difference -- a top-to-bottom improvement no less. I look forward to hearing more products from BPT. Prices: BP-2 Ultra Edition, $799 USD; BP-Jr., $249.